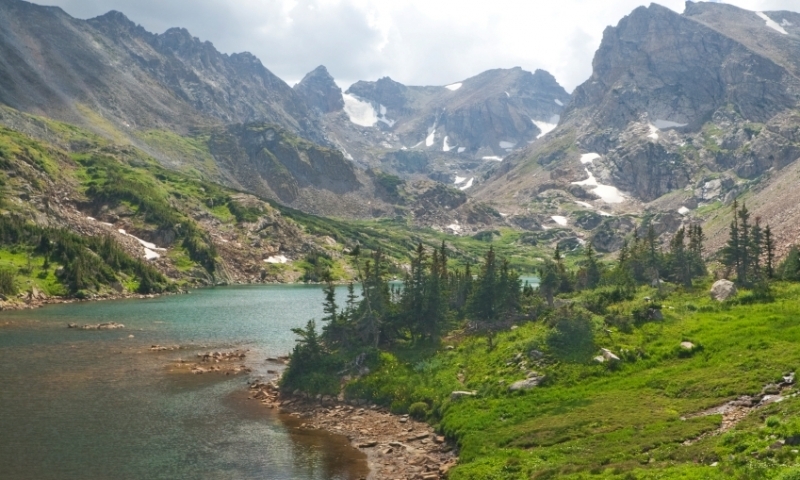 The Indian Peaks Wilderness bursts with natural beauty, boasting fifty lakes, eight mountain peaks named after Native American Tribes, and unparalleled views that are granted from its four pass trails. There are no campgrounds within the Indian Peaks Wilderness, ONLY designated campsites within backcountry zones: Diamond Lake, Jasper Lake, Crater Lake and Caribou Lake. Bring a camp stove. The Indian Peaks is one of the most heavily used wilderness areas in the country; weekdays are usually less crowded than weekends. The Indian Peak Wilderness has a rich and long history within the Colorado Rockies; carbon dating on pottery, tools and other remnants has proved that it once harbored prehistoric humans, long before the Arapaho Indians took up residence. For centuries, the Arapaho Indians would inhabit this area during the summer months to fish and hunt; this area is home to elk, mountain lion, black bear, mule deer, and snowshoe rabbits, to name a few, and trout swim in the many streams. To this day, low rock walls and other structures used to drive and trap animals can still be seen. The Pioneers traveled to this area in the late 1800's in search of gold and silver, but many of the mines turned out to have nothing more than low grade ore. There are also four trail passes, offering visitors a chance to witness some of the most magnificent vistas in the country. The four passes are as follows: Devil's Thumb (11,747 feet), Buchanan (11,837 feet), Arapahoe (11,906 feet) and Pawnee (12,541 feet). This wilderness area is far reaching, but here are two main access points: the Boulder/Nederland area (known as the 'Gateway to the Indian Peaks') and in Grand County, near Lake Granby. See directions to trailheads below. Day hiking is allowed without a permit but backpacking between June 1 and September 15 requires a permit. Organized groups of backpackers must obtain a permit; up to 12 people can camp for up to 14 consecutive days with just a single permit. Campfires are illegal but camp stoves are permitted, and pets must be leashed at all times. Contact the Sulphur Ranger District for more information. Address: 9 Ten Mile Drive, Granby, CO 80446. Phone: 970-887-4100. Brainard Lake Trail (from Boulder/Nederland): This trail is about an hour away from Boulder, and this trail head leads to other trails through Indian Peaks. To reach Brainard Lake from Boulder/Nederland, take CR 102, which heads west off the Peak to Peak Highway just above Ward. Monarch Lake Trail (from Grand County): This four miles trail circles Monarch Lake, and visitors are welcome to kayak, canoe and fish in its waters. Bald Eagles and Osprey sightings are common. From Winter Park, drive Northwest on US Highway 40 toward Granby; drive through Granby and on the outskirts of town, take a right onto US Highway 34 toward Grand Lake. Drive about 5.5 miles and you'll see the Arapaho Bay Sign (aka Arapaho National Recreation Area entrance) on the right (County Rd. 6/Forest Rd. 125); take this right (onto Forest Road 125) and drive about 10 miles to the Monarch Lake Trailhead. Primitive/Backcountry Camping: There are no official campgrounds within the Indian Peaks Wilderness; primitive camping is permitted in designated campsites. Primitive campsites can be found at Diamond Lake, Jasper Lake, Crater Lake, and Caribou Lake. Permits are required for parties of 12 or more. Call 970-887-4100 for details. Crater Lake: Park at Monarch Lake Parking Lot and access this backcountry camping area via the Cascade Creek and Crater Lake Trails. Jasper Lake: Park at the Devil's Thumb Trailhead to access this backcountry camping area, roughly 2.2 miles from the trailhead. Diamond Lake: Take County Road 130 west from Nederland about five miles to the Hessie Trailhead. Travel west and north (about 3.8 miles) on the Devils Thumb Trail to the south end of the Diamond Lake Trail. Caribou Lake: From the Monarch Lake Trailhead take the Southside Trail along the south side of the lake for 1.6 miles. Caribou Lake is nine miles from the Monarch Lake Trailhead. Arapaho Bay Campground: The closest campground to Indian Peaks is Arapaho Bay Campground in Grand County. From Winter Park, drive Northwest on US Highway 40 toward Granby. Drive through Granby and on the outskirts of town, you'll see US Highway 34 - take this right. Travel 5.5 miles until you see the Arapaho Bay Sign on your right (County Rd. 6/Forest Rd. 125). Take the right onto Cty. Rd. 125 and drive about 9 miles until you see the campground sign. Turn left into the campground. Dogs must be on a hand-held leash at all times for their safety and to reduce the chance of conflict with wildlife or other visitors. Purify all water from lakes or streams before drinking; they make look pure and clear but Giardia and other parasites are commonly found and can cause serious illness. Campfires are prohibited on the east side of the Continental Divide, and they are prohibited in the following areas west of the Continental Divide: Crater Lake, Caribou Lake, Columbine Lake, Pawnee Lake, Gourd Lake, and Upper Cascade Creek. Where permitted, campfires must be located at least 100 feet away from trails, lakes and streams. Bury human waste in holes that are at least 6 to 8 inches deep and at least 200 feet from water, trails and campsites. Carry out toilet paper. Rugged and beautiful wilderness area near Vail Colorado. Explore the mountains around Estes Park, Colorado.